Stefania Berton and Ondrej Hotarek are the first Italian pairs team in figure skating history to win a medal at an ISU Championships, bronze at the European Championships 2013. Q: You said it was difficult to realize for you to be on the podium. How fresh is it now, after a few days have passed? Ondrej: Especially it is hard to realize the fact that it is the first medal for Italy ever in any figure skating championships for pairs. The first one we did was in the Grand Prix in the Grand Prix, at Cup of Russia, but this one is different, because it is the European Championship and it is really completing everything, making Italy much more important as a team. Stefania: It is incredible; we are the second in medals after Russia. 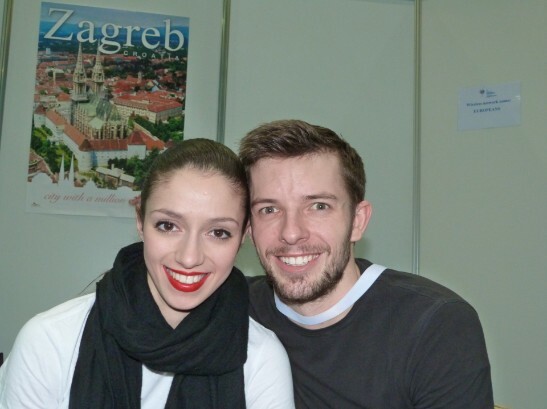 Ondrej: The thing is that next year we’re going to bring three pairs and three ice dance couples. That’s a great success for Italy. Stefania: It’s great. But we don’t know if we can do the third pair. There are some juniors. Ondrej: Yes, we’re building some. Let’s hope it works out and we can bring them. Q: Coming in you know it would be tough to be on the podium with the Russian teams including last year’s bronze medalists Ksenia Stolbova/Fedor Klimov and Yuko Kavaguti/Alexander Smirnov. Did you think it was possible to be on the podium? Stefania: We came here very prepared and ready to perform two very good programs, strong technically and choreography-wise. We were ready for the Championships. Once we got here we weren’t really thinking about the result, because it doesn’t depend just on us. So once we found ourselves third after the short program, we were really happy and excited, but obviously we didn’t come here with the idea to beat someone or to be beaten by someone, but just to skate the best we can. It is hard to remember in some moments, but this is the only thing you can control. Ondrej: On the ice for 2.50 and then four and a half minutes, you are alone. You don’t have any opponents..
Stefania: Yes, we don’t fight with someone. Ondrej: The last competition we did was Trophée Bompard where we ended up third and Yuko and Alex won. Definitely we weren’t thinking we are going to beat them easily. So we were aiming for the fourth (place). Doing our best we knew like we could be fourth, we never ended up ahead of Alexander and Yuko. Aliona and Robin, Tatiana and Max are still a little out of our reach. But we are going to work and try to get as close as we can. We are slowly making the gap smaller. Stefania: I think until last year we were always about 30 points from Aliona and Robin. Ondrej: The first year was like 50 points. Stefania: And then this year when we met Aliona and Robin we were 20 points (apart), but this time, it was less than 20 points. I’m not saying we’re ever going to beat them, but we are getting closer and closer which means that we are improving. They are at the top level and we are reaching there. Ondrej: You need time to grow, to convince the public, the judges…. Ondrej: It is not one competition that will make you as strong as Tatiana and Max and the Germans. Q: Aljona and Robin have been skating together for 10 years. Stefania: We know it is a lot about time. Q: How much pressure did you feel when you were third after the short? Ondrej: There was a lot of pressure, a lot of different kinds of pressure. Ondrej: I just tried to take her hand and go step by step. Stefania: You looked in my eyes and you told me: We’re going to skate. It is so stupid, but it can be little things like that. He just said, we’re going to skate, we do what we do in practice, we get on, it is me and you and we skate. That was kind of the key we used. Ondrej: We tried to simplify it, focus on what we focus in the practice, focus on what we have to focus, feel what you have to feel, when you are not sure about something, just look at me, rely on me. Stefania: And I do the same. Ondrej: We really try to feel what the other needs to do. That’s basically what used in the competition as well, what we use in the practice when we have to do our long program on Sunday at eight in the morning. Which we did, because there was no ice in Milan. We needed to skate on Sunday and the only hours available were at eight. Stefania: Between seven and nine. Ondrej: That was Sunday before Europeans. Stefania: We needed to do our long program and so we came in and did it. Even remembering that I was the one feeling worse. Q: What were your emotions when you were on the podium? Stefania: Proud and crying a little bit. I wasn’t really in tears, but I was still crying. And the thing I was most proud of was watching my flag going up with the other two. I don’t have many words. That moment with the flags did it for us. Ondrej: It was really much different , not like a revenge but maybe redemption after last year. Last year it was so hard. We were so close. Last year, on paper, we were kind of assigned to third place. After all the season, we beat Ksenia and Fedor at Cup of Russia, by many points. So everybody expected us to get the medal at Europeans. But then ... what happens in figure skating is that once one gets injured and then the other one. Ksenia and Fedor weren’t in top shape at Cup of Russia but then they had clean preparation and came really prepared to Europeans, while we didn’t have the right preparation. Stefania: Yes, he couldn’t stand on his feet two weeks before. It was just good for us to skate through the whole program. That was the main goal. They made a history case on Ondrej’s muscle problems because it never happened before. When we came off the ice, the doctor looked at him and said “it’s a miracle”. We didn’t really make it public, because we didn’t want to make it sound like an excuse. But it really happened and it was a miracle. Q: What was the problem with the muscles? Ondrej: All the training was very heavy. Stefania: Some values (parameters) of the blood were in thousands. They said it is supposed to be in 300 and he had it in 30 000. Ondrej: I was over the limit where the kidney could get compromised by this toxin. Your muscle gets so damaged by the overwork that they release this toxin and it is very hard for the body and the organism to get it out. I was four days in hospital to get it cleaned out. It took really ten fifteen days until I could completely stretch my arm again. So it was very hard before Europeans last year. Stefania: They said you should have that value so high only when a car hits you. And he did it on overtraining! Ondrej: This kind of injury happens to people when something falls on your muscles. It is like a compression of muscles. What happened, by so much work my muscles get so big and expanded. It felt like an inflammation. Stefania: The funniest thing is, at the very beginning we skated one or two days after this problem and he could stretch his arm only with me above his head. He couldn’t do it alone. Ondrej: If I look back, it was just so painful. I was so tired and I couldn’t explain myself. And then the doctor said, ok, we have to do blood tests and right after he is like, okay, tomorrow you have to come to the hospital to do all the exams. We did a couple of check ups and they sorted it out really quickly. So we were at least able to skate the Europeans. In the end we were happy that we could do it. Stefania: But we didn’t know until the day we left. We kept trying. The first day we tried the long program and he couldn’t skate. We didn’t skate for one or two weeks before that and after two days we tried the long program and none of our lifts went up. The second day, just one out of three, the last day all of them, but then I got sick, too. I got fever and I couldn’t stand on my feet. I was looking at Franca (Bianconi, coach) and said, “Franca, I’m this tired” and she said, this is the last day. If you make it now, we go, if you give up we don’t . Ondrej: When we have to choose between giving up or trying to make it anyway, we try to make it anyway. Then you never are going to have that regret. If there is a little chance, we’re going to try. Q: But now you have adjusted your training to make sure that this doesn’t happen again? Stefania: We changed all our preparation. Ondrej: Yes, because the off ice was just too hard. We take it easier. Stefania: We use a lot our body. Ondrej: Cardio, we run a lot. Stefania: We rely on the cardio. We try to put our elements from skating into the off ice practice, into the cardio. So we practice the two things together. Q: Your season has been great so far. How did you prepare? Stefania: We were in Detroit in the summer and we went back there before Skate Canada. We wanted to go back before Europeans at the beginning of the year, but as we decided to do shows, we did many shows, so then it would have been too much travelling. Ondrej: Time change, travelling, it takes you a couple of days. We were very happy to be invited by Daniel Weiss. It was a great experience. Ondrej: A great visibility, because we were on Italian TV all day long. One day, there were three exhibitions with us. Stefania: Yes, it was really funny. Our coach was like ‘I don’t want to see you anymore’. Now we go back to Detroit until Worlds. I leave in two days, so I can see my boyfriend (Rockne Brubaker). Ondrej: I stay a little in Europe. I have to go back to my hometown for a couple of days. Stefania: Then we’ll do another show with Daniel, “Rock the Ice”, in Canada. Ondrej: It is great. We are going to use it to work on our programs with Pasquale and Anjelika. And Jason will help us to sharpen the technique, because Worlds will be harder and we want to step it up. Q: And Michal (Brezina) has been helping you with jumps, right? Stefania: Michal is our assistant coach. Ondrej: Yes, at these Europeans I think he did the assistant coach for us and I kind of did the assistant coach to him. He would sit with us when we did the warm up. He was there all the time. When we go on the ice, he said, okay guys, see you later and he was waiting right after the Kiss & Cry and he was there all the time, at all the practices. Q: Yes, I saw him in the mixed zone and in the press conference. Stefania: Actually, when we started to skate together, we were spending almost the whole year, the whole summer, in Oberstdorf and he was there. They (Ondrej and Michal) are kind of brothers, because they grew up in the same town. I met him the first time here in Zagreb in 2008. This friendship and partnership in practice built up from the beginning of our career and it just grew with us. When we do competitions together, we just push each other to do better. That’s why we call him assistant coach. It’s really helping, because it helps you to remember, because you see, you are not the only one under this pressure. Cheer up, he is your friend and we do this together. Ondrej: I think maybe our medal a little bit pushed him to step further. He is like, I’m going to get it, too. Stefania: I was so happy when he got it, because he was fourth many times. I was screaming so much that my throat hurt. Ondrej: I must say, when I last saw him before he went on to the ice, I just kind of saw it in his eyes, because he had the you know, warrior look. He was so ready, and then I was a little bit nervous, because Javi skated right before him, he did so well. But Michal is a fighter and that what his goals and achievements he is so similar to us. He takes decisions and he is going for it. I think that is what we have in common. In Oberstdorf every time he was waiting for me. In Oberstdorf, the practices are singles, pairs, singles, pairs. Stefania: He was watching us. Ondrej: So maybe we would come one hour earlier so we could watch him and we could watch us. Stefania: He has such a good eye. When something maybe in the throw was wrong, it really can be because of the pattern that is a little different and it changes your movement a little bit. He has such a good eye for this kind of stuff and sometimes he is even correcting us. He is naturally talented for that. Q: Thank you for the interview and good luck for Worlds!